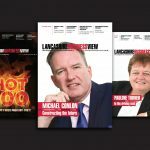 Lancashire Business View is the must-read magazine for commerce and industry in the region. Lancashire Business View aims to celebrate excellence, provide platforms to share success and encourage trade in the county. Its pages contain news, analysis and opinion on the issues that affect business in Lancashire. There is key information that can help businesses flourish, and entertaining features on the personalities behind the headlines. Lancashire Business View has a print circulation of 9,000 high-ranking decision makers. Lancashirebusinessview.co.uk is updated daily with business news and events and has an email subscriber database of 11,000.